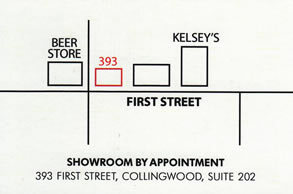 I invite you to visit our new and very unique showroom located at 393 First St. in Collingwood – a brand new office building (with elevator access) to our second floor display room. There, you will find an outstanding display of the latest in highly crafted cabinetry designs and a full range of countertop materials from stainless steel to natural stone, wood and solid surface. Our showroom also features, in addition to kitchen and bath concepts, entertainment centre, beverage centre and other design opportunities. I promise you a visual experience that will be outstanding. What our showroom doesn’t display can be found in our full colour supplier brochures or showrooms. I prefer to work with clients on an appointment basis so that we will have an uninterrupted opportunity for personal consultation and service at no charge to you. If a personal visit to our suppliers’ manufacturing premises is desired, I will arrange the details to accompany you on a no-cost visit as part of our service. Please call me to set up an appointment. I would like to have the opportunity to show you some truly exciting interior design ideas.